These easy pork chops are slowly simmered with tomatoes and seasonings for a simple main dish everyone will enjoy. It's also a great starting point for other flavor combinations. This is a simple, no frills pork chop skillet dish, and it's super easy to prepare and cook. The chops are excellent served with hot cooked rice, or serve them with potatoes or a rice pilaf. 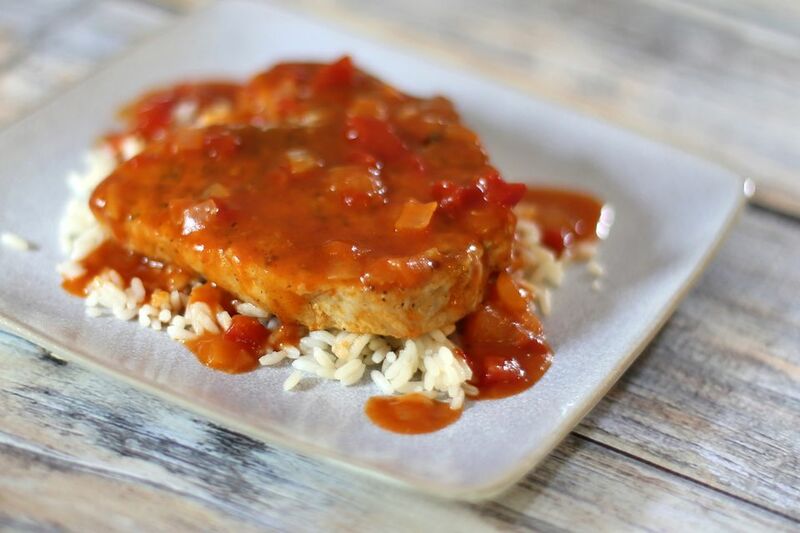 The pork chops are also versatile, and you can season them with some Creole or Cajun seasonings and stewed tomatoes or add chili style tomatoes and chili powder for Tex-Mex chops. Add some basil and garlic for Italian-style. You'll find more suggestions below the recipe. Heat a large skillet or saute pan over medium-high heat. Add the oil to the hot pan and sear the pork chops, turning to brown both sides; drain off excess fat. Add onion, green pepper and tomatoes. Season with salt and pepper. Cover the pan and reduce the heat to low. Continue cooking for about 45 minutes to 1 hour or until the pork chops are very tender. Remove the chops and arrange them on a warm serving dish or platter with hot cooked rice, noodles or potatoes in the center if desired. Pork shoulder chops benefit from long, slow cooking. If you are substituting loin chops or rib pork chops, decrease the simmering time to about 20 minutes. For extra sauce, add a small can of tomato sauce (8 ounces). Cajun or Creole-Style Pork Chops: Increase the onions to 1/4 cup and add about 1/4 cup of chopped celery. Replace the tomatoes with stewed tomatoes and replace the salt with Creole seasoning. Taste and add more salt as needed. Tex-Mex Pork Chops: Replace the diced tomatoes with chili style tomatoes or tomatoes with green chile peppers and add 1 teaspoon of chili powder and a dash of cumin. Add some hot or mild chili peppers for heat, and serve them with beans and easy Mexican style rice. Italian-Style Pork Chops: Add 1 clove of minced garlic along with the onion and green pepper and add 1/2 teaspoon of dried leaf basil.